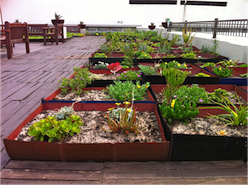 During the development of the PZ rooftop, recycled goods were used wherever possible. 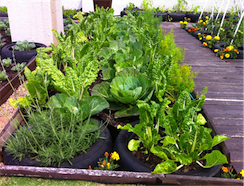 This included used tyres from around the inner-city, used for the landscaping and creating vegetables beds, whilst used drums were cut in half, drilled for drainage and used to plant in. Pallets were collected, fixed up and used as walkways, and the benches and tables were created from recycled plastic.